Following the introduction of the uniform business rate in 1990, local property taxation changed dramatically, whilst retaining many of its historical and familiar characteristics. Rating Law and Valuation details the existing, non-domestic rating system from the principles of rate liability and the definition of hereditament, the rateable value, to the procedure for compiling and altering the rating lists. The book also discusses how the methods of valuation are used by rating valuers to produce rateable values for the more common property types. The text concludes with a similar treatment of Council Tax which is levied on domestic property. 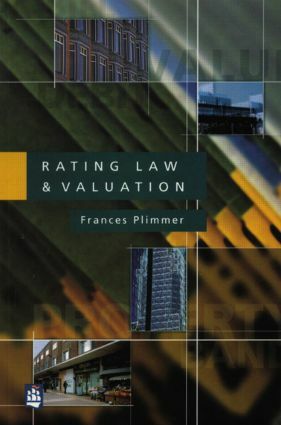 Rating Law and Valuation is written primarily for those studying property valuation as part of their course, and is an indispensible reference book for those taking professional courses of The Royal Institution of Chartered Surveyors (RICS), Incorporated Society of Valuers and Auctioneers (ISVA), and Institute of Revenue and Rating Valuation (IRRV). It is also a useful resource for practitioners who are required to deal with rating law and valuation but who do not do so on a regular basis.